This FIRMING anti-cellulite body oil combines the highest grade of NATURAL, non-gmo ingredients that are organic or wild crafted. Each ingredient is SOURCED in EUROPE (because the quality is superior) from small suppliers who are trustworthy and discreet. 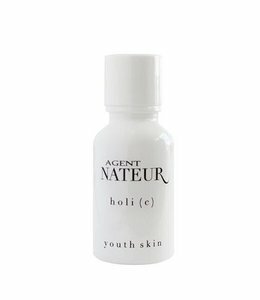 Agent Nateur has searched the world to find the most effective anti aging vitamins and oils to create a formula that is HEALTHY and non toxic. Each of the ingredients is Ecocert approved. Ecocert is the organic certification organization in Europe with the highest safety standards for organic products. h o l i ( o i l ) WORKS. It PENETRATES deep into the skin to tighten, hydrate, reduce cellulite, HELP scars, body acne, and SUN damage, it HELPS to correct hyperpigmentation and dark spots and REPLENISH collagen. h o l i ( o i l ) gives an INCREDIBLE glow and smells HEAVENLY. We hope you LOVE it.